Hey everyone! There are lots of things I try to do at the end of each school year so that I don't come back in August to a crazy mess, but there's always prep work to be done in those first few teacher days. 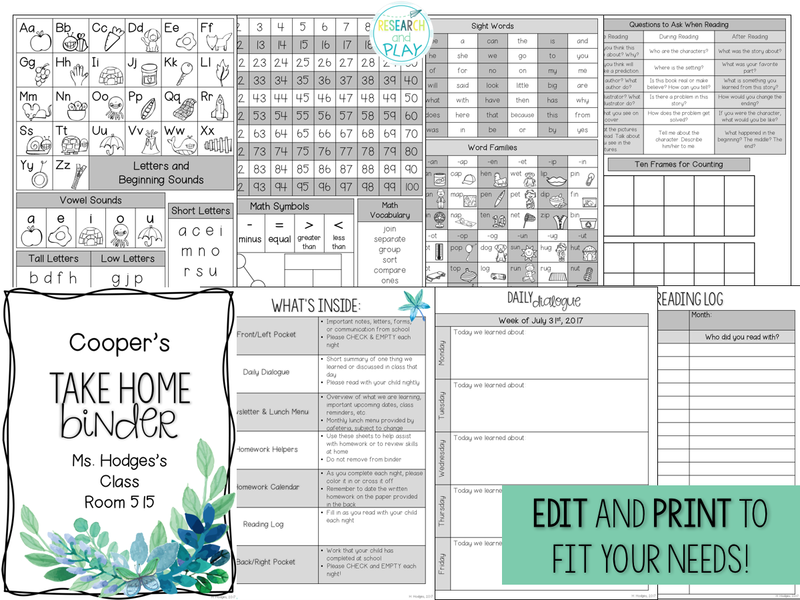 I always plan for the first day, prep all of my Play Centers, get all of my Back to School Forms printed and ready, and prep my Take Home Binders. Even though I won't have binders for all of my students until they bring them in from their class wish list, I still always make all of the copies before school starts so that my aide and I can quickly pull and assemble binders once they arrive. 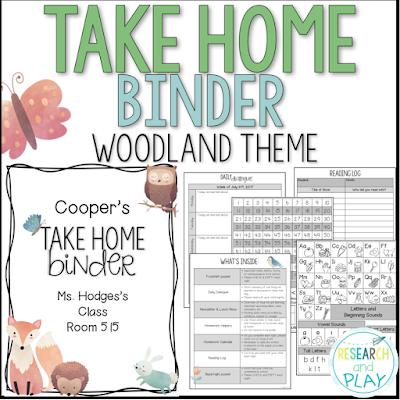 I have been using Take Home Binders (they've been called all sorts of other names, but I think I've finally decided to stick with this one) since my second year of teaching. During my first year, the school purchased student planners and parent-teacher communication folders for every student. Those worked really well! I knew, though, that I wouldn't be able to afford planners AND folders for my students at my new school. So, I made Take Home FOLDERS. Big mistake. See, my old school bought those thick, flexible, plastic folders that had clear cover inserts for the front and back. Those puppies don't destruct. But those folders are also expeeeeeeensive if you're buying them yourself from your own pocket. So I tried my best and got the "nice" plastic, 3-prong folders from Walmart. They didn't have a clear cover, so I had to TAPE ON THE COVER with clear packing tape. You guys, let me remind you it was my second year of teaching and I was still 25 years old without a clue. Long story short: those folders were falling apart by December and any introduction of fluids (water bottle or who knows what else) made them self-destruct almost immediately. Well, dang. That's when I bit the bullet and went out to buy a class set of 1-inch, white binders with a clear cover. You can actually get them in sets of 2 from Staples, although the Staples brand binders aren't nearly as sturdy as the Avery binders. After re-printing the entire binder for my whole class, replacing the page protectors, and almost crying from exhaustion and defeat, I had my first set of Take Home Binders. Well, to make another long story short, those binders lasted for the rest of the year practically unscathed! The occasional water bottle spill definitely affects them because, duh, but overall they were a success! Never again was I having to stop my morning routine of checking folders and taking attendance and greeting students with, "MS. HODGES! 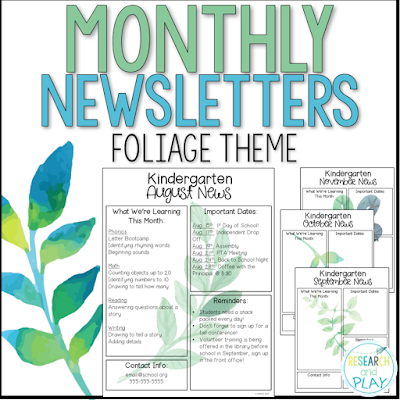 My folder is wet and so is my newsletter/homework/note from my mom/note from you/lunch menu!" Me: "Ok hold on, let's just lay it by the window and see if it dries!" It never dries like you want it to, y'all. So now here I am, almost 30 years old and much wiser. 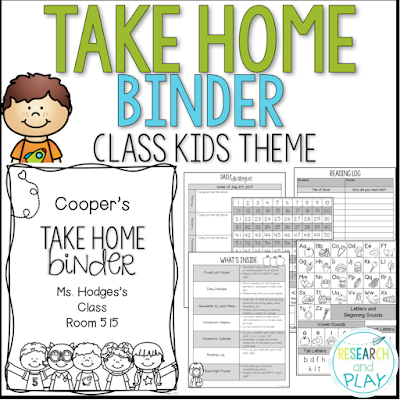 I have my students put the binders in baskets next to their tables, and all day as they do their work (if it's something I don't want to have them turn in) they just pull out their binder, slip their work in the back pocket, and done! 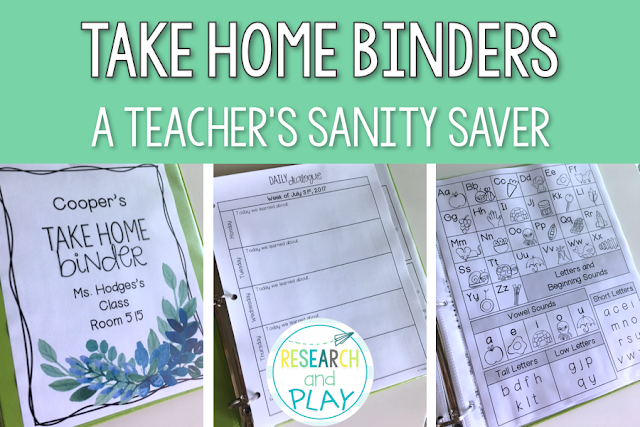 Parents know where to look for EVERYTHING because EVERYTHING is in the binder. Always. Students start managing themselves and their belongings. Trust me, you want to use Take Home Binders. Cover: I type my student's name and my class info and done! This is so easy for when you get a new student in November/January/May (yes that last one's happened more than once). What's Inside: I slip this "table of contents" page in the back cover. It's crucial you get binders with a front and back clear cover. 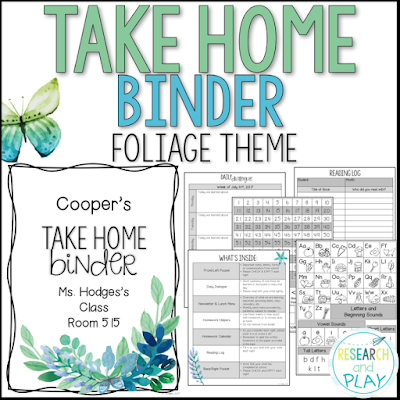 This allows parents to see EVERYTHING that's inside the binder. Daily Dialogue: Each afternoon, my students get out their Take Home Binders and flip to this page. I project one up on our screens and we have a quick little shout-out session of what we learned & talked about that day. Then we pick one thing and write it in! This is a fun wrap up activity AND prevents the "I dunno" response to the age-old impossible parent question: What did you do at school today? 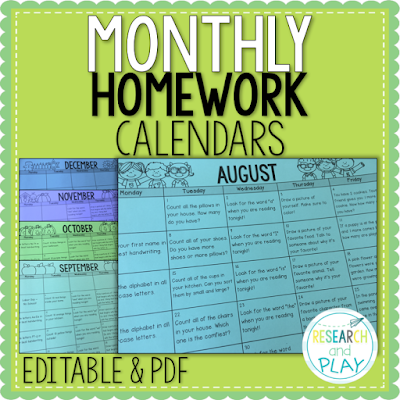 Homework Helpers: I have 4 pages of what you could also call "kindergarten study guides." My students' parents say they LOVE these pages. Super helpful while doing homework or, as a few parents have told me, great for when you're sitting in a waiting room and have your binder with you. Pull it out and read your letters or sight words! Win! Reading Log: Well, because we want to see how many awesome books our kids are reading! 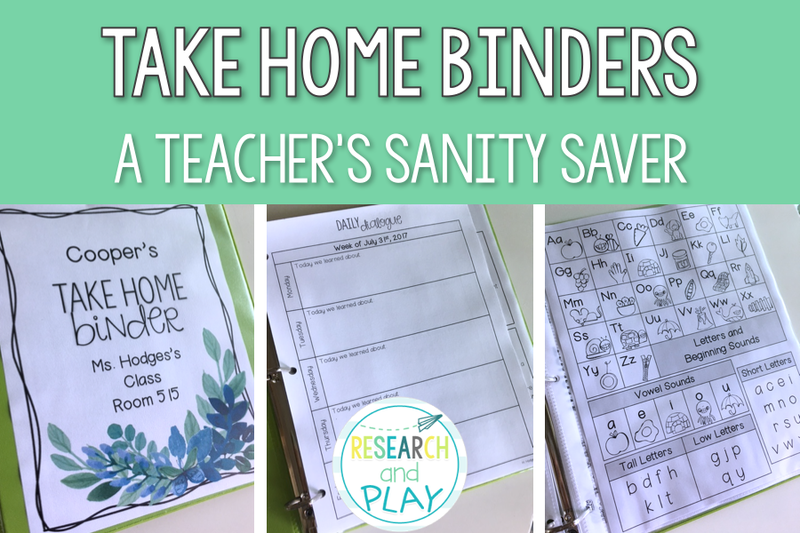 I hope you try Take Home Binders in your classroom. Everything goes inside and you never have to worry about flimsy folders falling apart on you ever again! Enjoy!